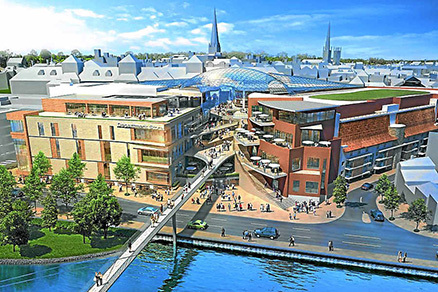 TPP assisted UK Commercial Property Trust Limited in securing planning consent for the New Riverside development in Shrewsbury. The £150 million regeneration project included the demolition of the existing Riverside centre and the construction of a new 20,900m² centre to be integrated with the Darwin and Pride Hall centres and provide stronger links to the town centre. In addition to a 8,825m² Debenhams department store, the proposals included 50 new shops, 10 restaurants, offices and car parking. As part of the development team led by Shearer Property Group, TPP prepared the Transport Assessment and Travel Plan for the scheme as well as providing advice on the design of the car parks and service areas.